Minder is an ultra-compact, highly efficient, electric water softener, designed to fit neatly under the kitchen sink, offering the latest energy-saving technology & comes with a full 15mm fitting kit ready to 'plug & play'! 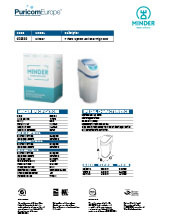 Minder provides more softened water and a higher flow rate compared to most softeners on the market, in less space. Designed to be easily installed in those places that other brands are unable to reach and offers maximum comfort both in salt loading and maintenance. Its ultra-compact, double thickness cabinet makes it a durable, almost indestructible household appliance. Thanks to its logarithmic volumetric system, it offers different capacities which allows it to adapt to any household's water needs offering maximum efficiency performance with maximum salt and water savings. Minder's intelligent programming takes into account consumption peaks and performs micro-regenerations every day to avoid running out of softened water in the home. At the pre-set time, it performs a full regeneration, leaving it ready to start its new softening cycle. It has a highly reliable control valve & operating system with all mobile parts Teflon-coated, guaranteeing durability and preventing premature wear.